Assistant professor at the Department of Physical Geography and Geographic Information Systems under the Faculty of Geography of Altai State University, Candidate of Geography Vladimir P. Galakhov and senior lecturer at the Department of Economic Geography and Cartography, Elena V. Mardasova developed an algorithm for estimating the maximum possible rise in water level in the Charysh river basin within the framework of a regional project supported by the Russian Foundation for Basic Research. Altai Krai suffers from the flooding of residential areas every spring. Flood forecasting is a complex process. Firstly, the flood situation is influenced by many factors: the amount of precipitation (both liquid and solid), temperature conditions, the degree of soil freezing, ice jams on rivers, etc. Secondly, significant amounts of meteorological information are needed for the forecast. And just the main problem in the hydrological forecasts of floods during long winter is the poor availability of meteorological information for the studied basins. “In order to make a long-term forecast of maximum spring water discharge and river level, one needs to know the volume of flow, which, in turn, depends on snow storage in the river basin. There is no complete information about snow reserves in the Charysh basin, since only three meteorological stations operate in the study area, and these data are not enough. The developed algorithm made it possible to calculate orographic additions to the speed of vertical movements during the formation of snow in the Charysh basin, and thereby determine the average values of winter precipitation for a specific winter period. Then we used the obtained data to estimate the maximum level of rising water in the Charysh River,” Vladimir Galakhov commented. It is worth noting this method is not usually used in the practice of Russian specialists, that is, this is a completely new approach to the determination of snow reserves. 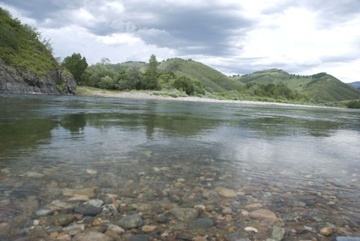 The developed algorithm was transferred to the Altai Center for Hydrometeorology and Environmental Monitoring and can be used for other river basins of Altai Krai where residential areas are submerged. The results obtained during the project implementation can be used in making management decisions in the field of prevention and response to natural emergencies by the relevant services: the Emergency Situations Ministry in Altai Krai, the Directorate for the Implementation of Civil Defense and Emergency Situations in Altai Krai, municipal administrations.